The paddle steamer Delta arrives at the Cambridge wharf, in the late 1800s. 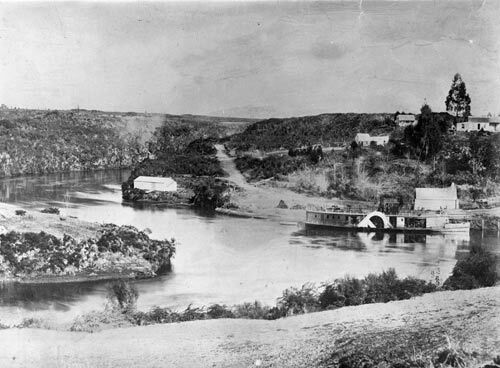 Before roads and railways were fully developed, river craft transported people and cargo, providing a vital service for settlers at places along the Waikato and Waipā rivers. The Delta was launched in 1876 and worked the Ngāruawāhia–Alexandra (Pirongia) and Ngāruawāhia–Cambridge routes on alternate weeks. As well as a saloon cabin and a ladies’ cabin, the vessel had a large upper deck capable of carrying 100 passengers (or 300 sheep). Permission of Hamilton City Libraries must be obtained before any re-use of this image.